Rep. Adam Schiff, D-Calif., a member of the House Intelligence Committee, sees the heightened concern by Americans about newly-revealed surveillance programs as a chance for progress on measures he’s long advocated. Photo by Bill Clark/ CQ Roll Call. California Democrat Adam Schiff is one of Congress’ most prominent advocates for more openness from U.S. intelligence agencies about their activities. As a member of the House Intelligence Committee, he was aware of the secret National Security Agency (NSA) program that collected millions of Americans’ phone records long before it was leaked in early June by former NSA contractor Edward Snowden. But Schiff says Snowden’s idea of openness is not the same as his. “Mr. Snowden has done substantial damage to national security and we’ll be trying to measure that damage for some time,” Schiff said in a phone interview from his office last Thursday. Schiff acknowledges a foreign-based terror suspect might be expected to know that calls made to the U.S. would be tracked, as the program Snowden leaked demonstrated. But Schiff says he’s learned through intelligence briefings not to guess about how capable those who want to harm Americans might be. “It’s a wide variety of people, some sophisticated, some not sophisticated, some state-sponsored, some not. Some who speculate about what we’re doing and can’t act with full confidence of what we’re doing until things are declassified or leaked,” says Schiff. But Schiff also grants that Snowden’s revelation about the massive collection of Americans’ communications records has sparked a useful public discussion. “Has it prompted a debate over transparency, the nature of the programs? Yes. But is there a better way to do that? Absolutely. I don’t think that this is the way we need to initiate a debate over privacy and security, ” he said. Nonetheless, Schiff sees the chance for progress on measures he’s long advocated, sparked by heightened concern by Americans that the newly-revealed surveillance programs are invading their privacy. One of Schiff’s proposals: instead of intelligence agencies collecting massive phone records from providers then searching them, the agencies could let the companies keep control of their records. “I encouraged the NSA some years ago to look into having the communications providers maintain their own metadata. 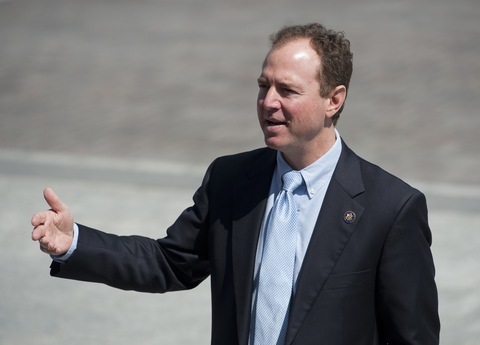 Then we would only go to them when we had a query to do, rather than our maintaining the metadata,” Schiff said. Schiff says his idea gets a better hearing since the public learned of the massive data collection by the government. Similarly, Schiff has seen progress for his push to release rulings of the secret federal court that oversees U.S. surveillance programs and other classified activities. “I think there’s now a lot of momentum behind declassifying some of the FISA [Foreign Intelligence Surveillance Act] court opinions. I’ve introduced the House counterpart to Sens. [Jeff] Merkley, D-Ore., and [Mike] Lee’s, R-Utah, bill that would require disclosure of FISA court opinions,” he said. Schiff says the discussion resulting from the Snowden leaks has had an impact on the leadership of the intelligence agencies. “I think they’re recognizing the need to balance the imperative of having public support for what they do — which requires them to take the public into confidence about what they do — with a need for secrecy. And I think up until now the default always has been, keep things classified, keep things under cover because there’s no national security downside to doing that,” he said. Schiff says that view by intelligence officials is changing. More impetus for that change came Friday when 26 senators — mostly Democrats — called on the director of national intelligence to share with the public more information on the current practices and recent history of collection of citizens’ communications data. The aim is “to give the American people the information they need to conduct an informed public debate” about national security and domestic surveillance, according to Sen. Ron Wyden, D-Ore., a leader of the group.